EMP – Hardening computer/comm assets (shielding) and low-vulnerability electronics (using tubes instead of semiconductors). Redundant systems including amateur radio communications run by volunteer organizations such as ARES. Solar power electrical generation including solar power from space. Let us know what other areas should be covered! Colored version of illustrations from the 1994 U.S. Army report ADA278230, Nuclear Environment Survivability. The mechanism is for a 400 km high altitude burst EMP: gamma rays hit the atmosphere between 20–40 km altitude, ejecting electrons which are then deflected sideways by the earth’s magnetic field. This makes the electrons radiate EMP over a massive area. 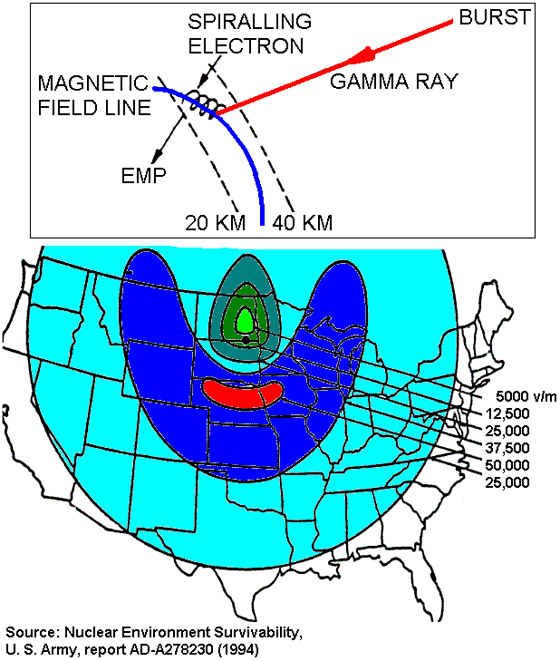 Because of the curvature of earth’s magnetic field over the USA, the maximum EMP occurs south of the detonation and the minimum occurs to the north.